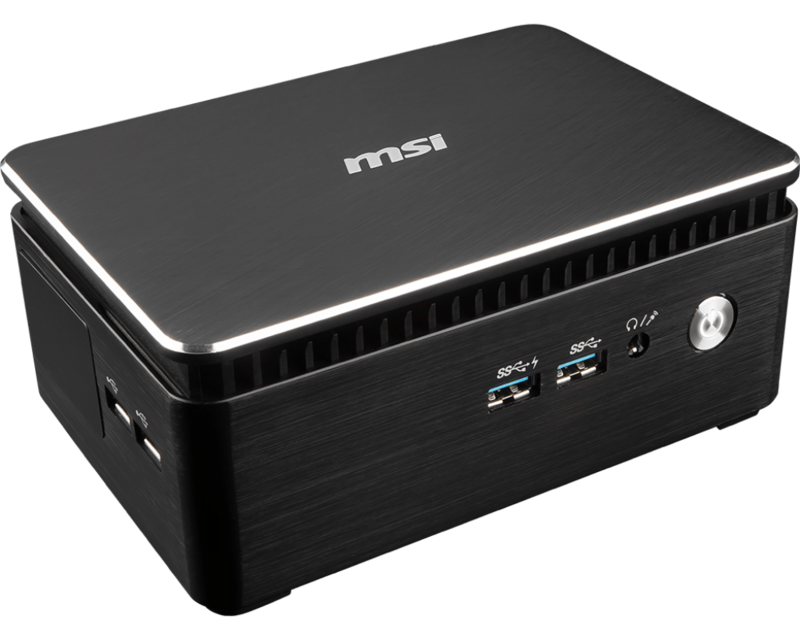 MSI has introduced a new family of its ultra-compact form-factor Cubi PCs, based on Kaby Lake-U processors. The Cubi 3 Silent and Cubi 3 Silent S use an entirely new design and do not have any fans. The Cubi 3 Silent is designed for basic SOHO, whereas the Cubi 3 Silent S targets more demanding users in business and commercial environments. 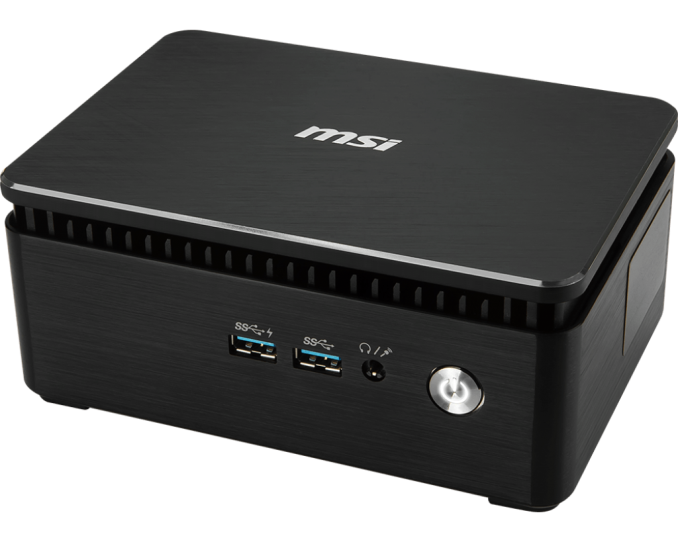 MSI started to experiment with UCFF PCs a while ago starting with the original Intel NUC-like Cubi in 2015. Since then the company has released multiple versions and generations of Cubi-branded systems, some of which were are not exactly ultra-compact. The UCFF Cubi computers remained the same for two generations — tiny PC barebones made of plastic based on Intel’s U-series SoCs and featuring a blower fan to cool the system. With the third generation, MSI decided to switch to aluminum chassis and passive cooling to make systems that stand out among other NUC-like PCs. To a large degree, the chassis serves as a big radiator for the CPU inside. In a bid to emphasize the main selling point of the new barebones, the company rebranded its UCFF systems to Cubi 3 Silent and formally added them to the lineup earlier this month. The MSI Cubi 3 Silent barebones are based on Intel’s Kaby Lake-U SoCs. MSI does not disclose the exact models it intends to use, but confirms that they feature Intel’s HD Graphics, which limits the choice to 15 W KBL-U SoCs with the HD Graphics 620 (24 EUs) and excludes more powerful models with Iris Plus-branded parts. The systems are equipped with two SO-DIMM slots for up to 32 GB of DDR4-2133 memory, one M.2 slot for an SSD (PCIe or SATA) as well as one SATA port for a 2.5” storage device (to be located under the motherboard). Like most modern SFF PCs, MSI’s Cubi 3 Silent feature a wireless module supporting 802.11ac Wi-Fi and BT 4.2. While the Cubi 3 Silent and the Cubi 3 Silent S share the same 1.2-liter chassis and have the same base functionality, the I/O capabilities are vastly different and define the positioning. The MSI Cubi 3 Silent is equipped with one GbE port (using a Realtek controller), an HDMI 1.4 output, a DisplayPort 1.2, and USB 3.0 Type-A headers. 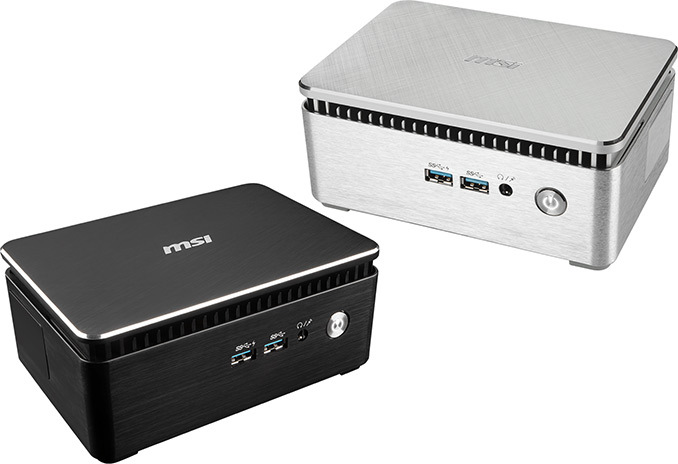 By contrast, the MSI Cubi 3 Silent S comes with two GbE connectors handled by Intel controllers (many business and commercial customers request Intel controllers), an HDMI 2.0 output (since we are dealing with Intel’s 7th Gen Core SoCs, MSI most probably uses an LPSCON to support this), a DP 1.2 port, four USB 3.0 headers, two additional USB 2.0 ports as well as two COM ports. The latter can be used to connect various equipment in commercial and even industrial environments, but it is not completely clear whether all applications that require COM ports can run under Microsoft Windows 10 (KBL-U does not support Windows 7 or XP). Intel’s Kaby Lake-U SoCs have a revamped media decoding engine that supports VP9 and HEVC (H.265) decoding, which makes MSI’s Cubi 3 Silent systems good candidates for HTPC. Meanwhile, if someone needs an HDMI 2.0 output (a very likely scenario) to connect them to a 4K UHD TV, they will need to get the more advanced Cubi 3 Silent S with an appropriate connector. MSI’s Cubi 3 Silent and Cubi 3 Silent S are expected to hit the market in the coming weeks. Pricing for exact models is yet to be confirmed, but naturally expect the Silent S to be more expensive because of more advanced I/O features and general positioning. In the meantime, MSI is selling off previous-generation Cubi 2 systems at Amazon with a discount. The TDP may be the same but the power consumption of the quad core U series in the Dell XPS 13 is much higher than the dual core Kaby Lake. This is an issue for a passively cooled device so it may not offer much real world gain. "Meanwhile, if someone needs an HDMI 2.0 output ...they will need to get the more advanced Cubi 3 Silent S"